You are here: Home / Tips / Take a College Tour – You Can’t Afford Not To! 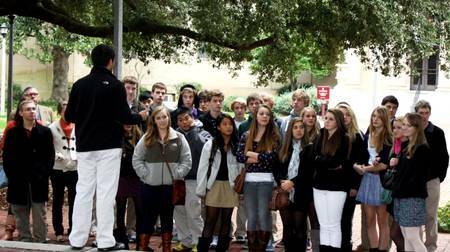 Take a College Tour – You Can’t Afford Not To! Trying to take a college tour can be daunting, but that doesn’t mean that it has to be that way. If you’re thinking about touring colleges right now, chances are good that you’re still in high school. There’s a lot of money on the line, and going to the wrong college could mean that you’re missing out on a great financial aid package. It’s up to you to figure out exactly what you want to get done, where you want to go, and how you’re going to pay for it. Yet it all starts with the tour. Even though it’s impossible to really get the full experience from a college tour, there is something to be said about going on them anyway. It’ll help you really figure out if a college is right for you. Don’t go with shiny brochures that make everything sound like a walk in the park. Go to the college itself and check it out on your own terms. If you’re traveling with your family, here’s a few ways to get the most out of the college tour experience. First and foremost, make sure that you’re taking everything with a grain of salt. As mentioned earlier, the college needs to sell you on going there…and only there. So on college tour day, expect everything to be coated with a thick layer of salesmanship. They can’t afford to lose you as a customer, and that’s exactly what you are — a customer. You are being sold to within the entire experience. That doesn’t mean that college isn’t worth it — merely that you need to decide who actually gets to win you at the end of the day. Ask good questions and don’t settle for canned responses. If you’re curious about a program, ask about it. If you’re wondering where you’re going to actually live, ask about that too. Try getting away from the tour guide and asking real college students that attend how they like it. The tour guide is most likely going to be a student, but they are encouraged to sell you on going. They will tell you anything that you need to hear in order to get you to do that. Ask students that aren’t that invested in it — that will help you understand what life is really like there. Ask about the overall mixture of students. For example, what percentage of the school actually participates in Greek life? If an overwhelming number of students are Greek oriented and you don’t want anything to do with a fraternity or a sorority, you could end up making yourself pretty irritated in the long run. It makes more sense to go where you know that you’re going to fit in. If you’re a non-Greek and you’re on a campus surrounded by practically nothing but Greeks, it’s going to be a lonely place. Without realizing it, frat guys and sorority girls tend to associate with their crowd and that’s about it. They don’t really mean for it to end up that way, but it’s often the way it boils down to. Make sure that you’re protecting your social life as well, because you are going to have to network with other college students, and networking has become more important than ever before. Being able to get personally endorsed and recommended by someone is the name of the game here. Don’t just limit your discussions to the students — talking with staff is a good thing. It can even help you establish yourself as someone that’s coming to the school to really get a solid education. There’s no need to feel like it’s impossible to open up and speak to the faculty. They love questions and will steer you in the right direction. Some people scoff at the idea, but taking notes can definitely turn out to be a good thing. You might imagine that you’re going to go back home and remember everything that you encountered and experienced, but this doesn’t really work out that well in real life. The truth is that by the time you get home, you’re going to be tired and ready to go lay down in your own clean bed. You will forget a lot of what you saw and experienced. Taking photos and even recording some video would be good. This comes into play even more if you’re cramming two or three college tours in one week! Some colleges let you attend a class so you can see what it’s like, and figure out what you’re going to major in. It might sound like a lot of questions, but we’re trying to have you avoid having to transfer to another college just because you didn’t like your experience. That costs you a lot of money, as not all classes will transfer. That’s pretty much like throwing money down the drain when you think about it. You won’t always get the perfect college, but you will get a college that’s going to meet your needs, and isn’t that the top priority these days anyway? Good luck!